Biography of Venetian Biblical Painter and Colourist. Louvre, Paris. By Paolo Veronese. of Christian art from the Mannerist era. Paolo Veronese ranks alongside Titian and Tintoretto, as one of the giants of Venetian painting, and one of the best history painters of the period. He is particularly renowned as one of the great colourists of the Mannerism school. A master of easel and mural painting, he is best known for (1) his monumental banquet scenes - depicted in massive religious paintings like The Wedding at Cana and The Feast in the House of Levi, executed for monastic refectories in the typically dramatic and colourful style of Mannerist painting - and (2) his illusionistic fresco paintings. Like his rival Jacopo Tintoretto, Veronese built on the work of Titian (c.1488-1576), the father of Renaissance art in Venice. But while Tintoretto's reputation is derived from his development of Titian's use of dramatic light and emotional intensity, Veronese achieved his by developing Titian's mastery of colour - what was dismissively known as colorito by artists in Rome. See: Titian and Venetian Colour Painting c.1500-76. A particularly versatile artist, Veronese's oeuvre includes frescoes, altarpieces, mythological narratives and portraits. Other important works include Madonna with the Cuccina Family (1571, Gemaldegalerie, Alte Meister, Dresden), Bathsheba in Her Bath (1575, Museum of Fine Arts, Lyon), and Four Allegories of Love (c.1580, The National Gallery, London). Veronese was also an exceptional draughtsman: for details, see: Venetian Drawing (c.1500-1600). Born Paolo Caliari - his nickname Veronese derives from Verona, the city of his birth - he was the son of a stonecutter, from whom he apparently learned how to model clay. According to the Mannerist biographer Giorgio Vasari (1511-1574), he trained first under the undistinguished local master Antonio Badile (c.1518-60) and, afterwards, under Giovanni Francesco Caroto. Veronese's precocious talent for drawing enabled him to quit the workshop by the age of 16, in order to seek an independent career. As it was, the linear methods of Mannerist painting, having been first introduced into northern Italy by Raphael's pupil Giulio Romano (1499-1546) and followed up by Parmigianino (1503-40) in his experiments with rhythmic values, and by Titian in his study of the constructive role of colour, were presented to Veronese in the heterogeneous cultural climate of his birthplace, as so many complementary choices. In this way, from his first works, which were possibly part of a systematic exploration of the various aspects of Mannerism, he purged it of all intellectual complication and enriched it with chromatic suggestions that demonstrated his growing mastery of colour theory in painting: see, for instance, The Virgin and Child with Saints and Donors (1548, Castelvecchio, Verona), painted for the Bevilacqua-Lazise family; the allegorical fresco paintings (1551) in the Villa Soranzo near Castelfranco Veneto, completed in collaboration with Zelotti; and The Temptation of St Anthony (1552-3, Caen Museum). In 1552, Veronese moved to Venice, where his first commission was a Sacra Conversazione for the Church of San Francesco della Vigna (c.1552). In 1553, Veronese (along with Ponchino and Zelotti) was awarded the commission for several ceiling decorations in the Doge's Palace, including the Sala dei Cosiglio dei Dieci (the Hall of the Council of Ten), as well as the Sala dei Tre Capi del Consiglio next door. It was here that he discovered colour as his principle means of expression, and achieved his big breakthrough. In particular, it was his three ceiling frescoes - for the church of San Sebastiano, the Doge's Palace, and the Marciana Library, (the latter won him a prize awarded personally by Titian), that secured his reputation as one of the leading Mannerist artists in Venice, and triggered comparisons with the figure painting of Correggio (1489-1534) and the heroic features of Michelangelo (1475-1564). Now in direct contact with the great masters of the city, where he established a studio in 1555 and which he made his home in 1557, Veronese worked out what was rightly considered his 'reply' to Venetian tonal painting, displaying an innovatory force that was understood and admired by Titian himself. The paintings for the Doge's Palace - Juno Pouring Gifts on Venice, Youth and Age, Punishment of the Forger and Virtue Triumphant (in situ); Jupiter Striking down the Vices and St Mark Crowning the Virtues (Louvre) - confirmed his great talent for decorative art, already manifest in his earlier works at the Villa Soranzo. The female nudes fill the picture space with daring sotto in su quadratura and bold foreshortening, invigorated by clear and luminous tones. 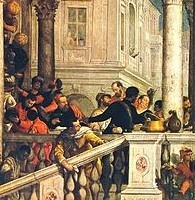 In about 1556 Veronese began painting the first of his large scale banquet scenes, The Feast in the House of Simon, which was not completed until 1570. In addition, at about the same time, during a pause in his work for San Sebastiano, he collaborated with the architect Andrea Palladio (1508-80) in the decoration of the Villa Barbaro in Maser. Veronese's painting aimed to fuse Christian spirituality with humanistic philosophy - the murals featured portraits of the Barbaro family, while the ceilings were filled with mythological figures set against blue skies - and employed a rich combination of complex perspective and trompe l'oeil. The result was described by contemporaries as "visual poetry". The next collaboration with Andrea Palladio led to Veronese's greatest work - The Wedding at Cana (1562-3, Gemaldegalerie, Dresden). Commissioned by the Benedictine Abbot at the San Giorgio Maggiore Monastery, close to St Marks in Venice, the contract required the painting to occupy a massive 66 square meters, and stipulated that the quality of the colour pigments should be the finest available. As many figures as possible were to be included. As it was, Veronese included a staggering 300 portraits (including those of Titian, Tintoretto, and even Veronese himself) on a canvas almost 10 metres wide. The subject, a scene from the New Testament Gospel of John, chapter II, verse 1-11, depicts the first miracle performed by Jesus, the turning of water into wine at a marriage in Cana, Galilee. The foreground of the picture contains a frieze of figures depicted in the most intricate and shimmering detail (personal jewellery, food on the plates etc.) flanked by two sets of steps leading to a background terrace, Roman-style colonnades, and a brilliant sky. Works like The Wedding at Cana, and The Family of Darius before Alexander (1565-1570) have little if any any emotional content - instead, their prime attraction is their narrative tableau of figures bursting with luminescence and colour. According to the modernist critic Theophile Gautier, writing in 1860, Paolo Veronese was the greatest colorist who ever lived - greater even than Titian or Rubens - because he maintained a range of natural tones instead of the standard Academic-style method of dark and light. The famous 19th century French Romantic painter Eugene Delacroix put it simply when he said that Veronese made light without violent contrasts, and maintained the strength of hue in shadow. In any event, he delighted in detailing the finery of Venice's leading citizens - his works are full of costumes in velvet and satin - and he employed a delicate palette in which pale blue, orange, silvery white and lemon yellow predominate. His prolific output was made possible through the establishment of a highly organized family studio, involving his brother Benedetto Caliari (1538-98), and sons Carlo (c.1567-96) and Gabriele (1568-1631). He had no significant pupils, But his influence, including his effect on the Venetian Baroque painting, surpassed the limits of generations and the frontiers of his city. For two centuries at least, many artists, including the very greatest, from Rubens (1577-1640) and Velazquez (1599-1660) to Giambattista Tiepolo (1696-1770), found a source of inspiration in the richness and inexhaustible variety of Veronese's work. See: Legacy of Venetian Painting on European art. - People of Myra Welcoming St. Nicholas (c.1582) Gallerie dell'Accademia, Ven. - Apotheosis of Venice (1585) Doge's Palace, Venice.  For details of other Venetian painters, see: Homepage.  For analysis of important pictures from the Venice School, see: Famous Paintings Analyzed.